I was one of the lucky one that was selected for the preview program last week. I updated to the New Xbox Experience on Friday, October 31. I like the new look of NXE. It’s nice, the menu movies fast and it’s easy to navigate. You have to get used to the new way of navigate your items, but that shouldn’t be a problem after some day of use. I’ve made a gallery where you can see many screenshoot. They where taken from standard definition recordings. 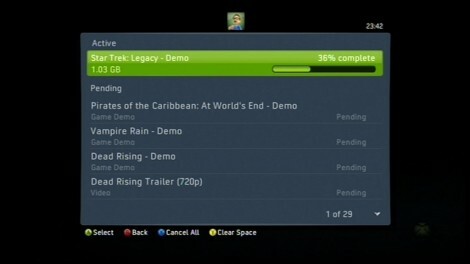 One thing that I’ve allways liked with the PS3, is that you can queue 16 items for download. 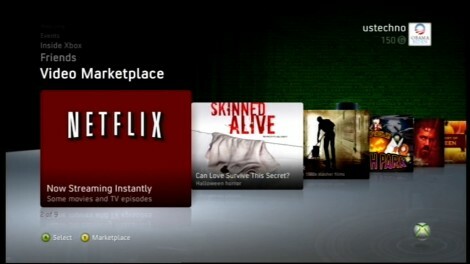 The previously 6 on Xbox have been a bit limited for my taste. So I had to check if they had changed that. I added item after item to the download list. So, you can now add 29 items to your queue list, that should be more than enough. One of the new feature in NXE is that you can install games on your harddrive. I’ve installed two games to test, and both weight in at about 4.5 GB each. I haven’t timed it, but loading times are faster. And what is equaly important, the DVD drive don’t spin, so the noise reduction is great. The big new feature is offcourse the avatar. Many have said the Microsoft ripped off Nintendo’s Mii. But Nintendo didn’t sadsd avatars. They have been around for years. They also look like Sims, but I haven’t seen that mentioned anywhere. 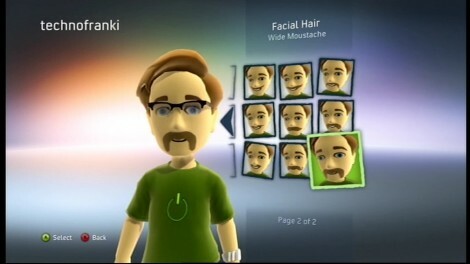 You can take picture of your avatar and use that as a gamerpicture. You can invate up to eight friends to a party for chatting and playing games. I haven’t tried that yet, since non on my friendslist have the NXE update yet. Have to wait for November 19. 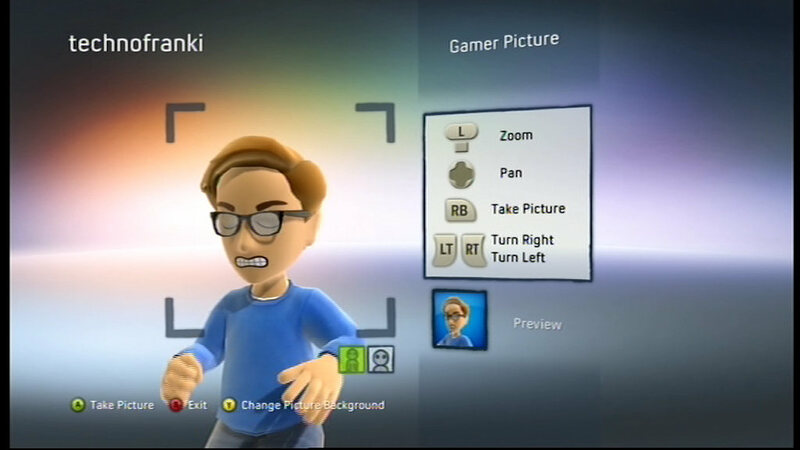 It’s easy to make an avatar as you can see in the YouTube video I’ve made. Netflix is another new feature, but only for Gold members in USA. 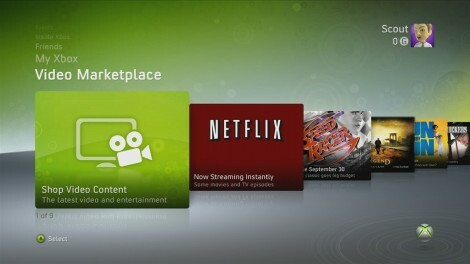 It let you stream movies from their movie cataloge. Even though you update to the New Xbox Experience, the old dashboard won’t disappear completely. It will live in the Guide-button. 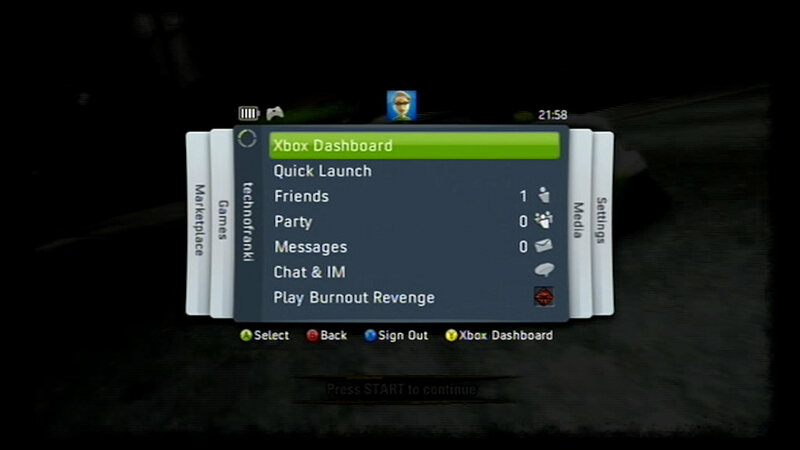 Even in-game, you can press the Guide-button and up pops the old dashboard in a more compact format. You can do everything here as you can in NXE. This is good, and may also work a bit faster with some functions. The New Xbox Experience is a great update, and you will soon forget that you had the old dashboard. It will be great when November 19 comes, and everyone can update to the new firmware. You can view a lot of screenshots in my gallery. Here is a YouTube video I made showing the new NXE. Here is the new intro that plays the first time you turn on your Xbox after the update. Every week until November 19, when you can update your Xbox 360 Dashboard to the New Xbox Experience, Gamerscore Blog is telling you something about the update. This week they talk more about avatars. So, you’ve made your avatar and now you’re wondering what to do with it. When the New Xbox Experience launches on Nov. 19, four existing Xbox LIVE Arcade games will be updated to include Avatar functionality to make your gaming even more personal. Join your friends and play UNO!, Bomberman Live, Hardwood Hearts and Hardwood Spades and watch your Avatar come to life with custom animations throughout game menus and lobbies. Here is also a videointerview with Larry Hryb, aka Major Nelson, and Stacy Law (avatar program manager) and Scott Brody (avatar program manager). 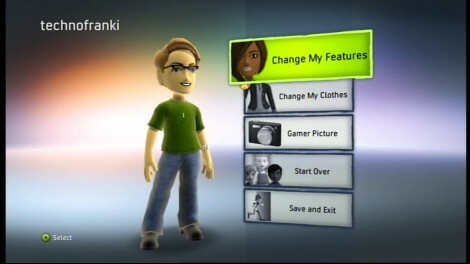 Last week I entered my application for the preview program to get an early access to the New Xbox Experience. Well, I got accepted! The update will be available on or before November 1st. Larry Hryb posted on MajorNelson.com that all the e-mails to the lucky gamers was sendt out. He have, at time of writing, over 1000 comments. I don’t think I’ve seen that many on any other Major Nelson post. Most of the ones I’ve read, have complained about that they’ve not been accepted in the preview program. Congratulations on your acceptance into the Xbox 360 Fall Flash Preview Program. 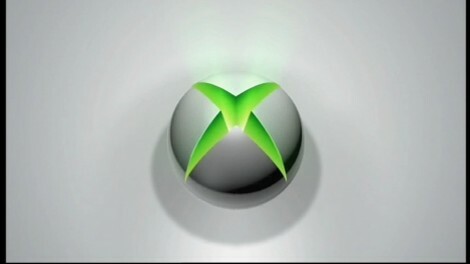 As a member of this program you will be receiving the New Xbox Experience (NXE) System Update. The update will be made available to you on or before November 1st. 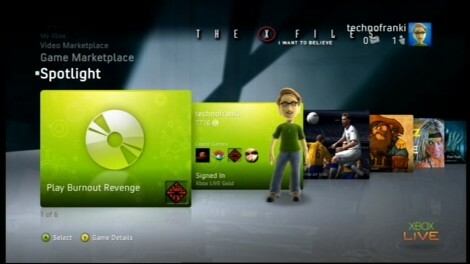 In order to receive the update, log in to Xbox LIVE with the Preview Program registered console. In participation with this program, you should not move your storage device (hard drive, or memory unit if you do not have a hard drive) to any other console as it will also update that console. If an unregistered console is updated with the NXE update, that console will not be able to connect to Xbox LIVE until the NXE has been officially released on November 19th. We thank you for your participation and hope that you enjoy the New Xbox Experience. You can now sign up for the New Xbox Experience. Major Nelson have released information on how you can sign up for an early access of NXE. There will be some thousand that will be selected. Once you do that, you need to fill out the “Xbox 360 Fall Flash Preview Sign Up” survey in order to be considered for receiving the Preview System Update. We’re asking a few questions about where you live, your home network, ISP connection and a few other pieces of information. We are looking for a good cross-section of our members in order to get the best feedback we can. Just completing the survey does not automatically get you access to the NXE. We’ll be making final selections from from the completed surveys. Xbox LIVE Gold and Silver members can sign up. Priority will be given to Gold members in the selection process. If you are accepted, you’ll hear from us in about a week. Make sure your information on Connect is updated so we can email you. So the New Xbox Experience is coming on November 19, but I realy hope I get selected for the preview program to try it out early. 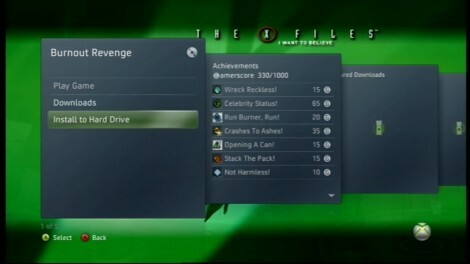 Every week until November 19, 2008 Gamerscore blog will have something new on the New Xbox Experience. This week they talk about Netflix. This feature will only be available for Xbox 360 owner in the United States. 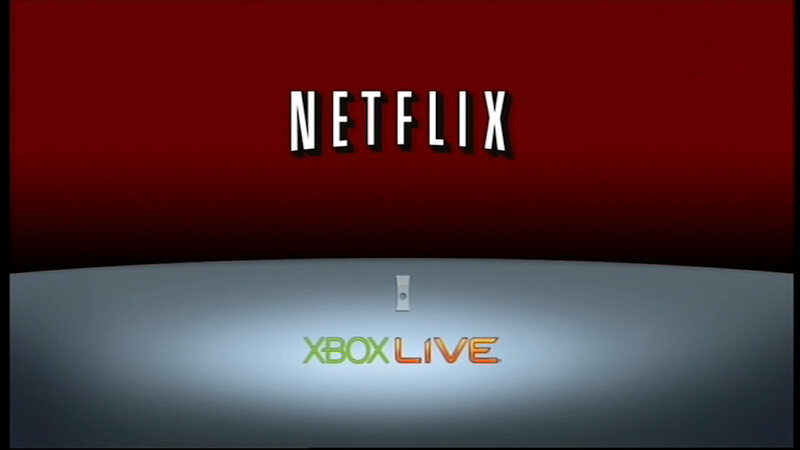 Relax – it’s time to get comfy again and turn on your Xbox 360. 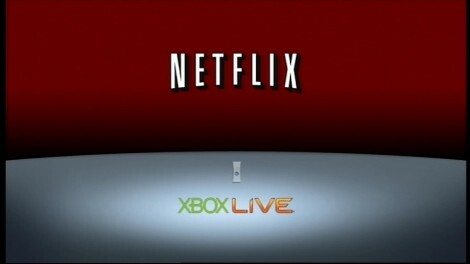 On Nov. 19, all movies from your Netflix instant watch queue will be instantly accessible and playable on your Xbox 360. 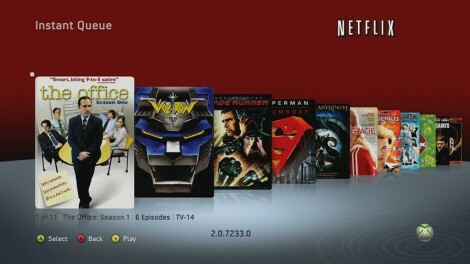 All Xbox LIVE Gold members with a Netflix subscription will be able to instantly watch more than 12,000 movies from the Netflix library at no extra charge. On top of that, you no longer need to put on make-up, “acceptable” clothing and shoes to drive to the rental store. 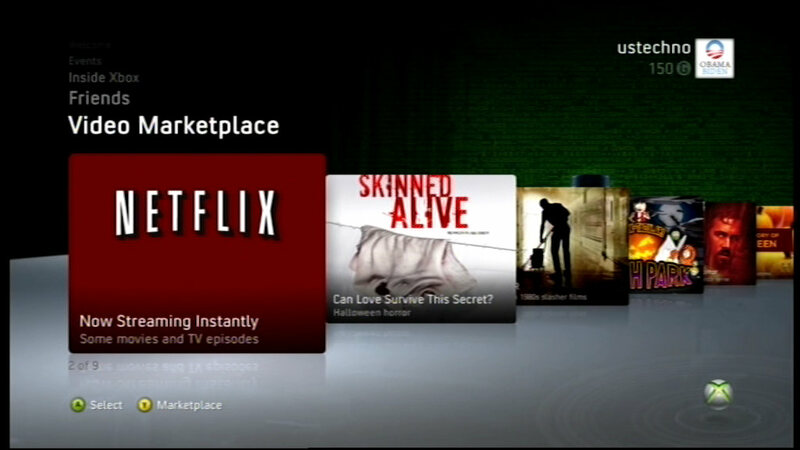 Xbox LIVE Video Marketplace offers more than 20,000 pieces of HD and standard definition content, and will have a new sleek look and feel that makes you feel like you’re browsing shelves right in your own living room. You’ll be able to see hi-res box art for all the movies and TV shows you love, plus read all the information that would usually be on the back of the DVD box. The New Xbox Experience require 128 MB of storage. 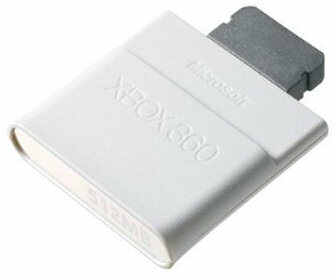 Not all Xbox 360 owners have that, but Microsoft have solution for that, some for FREE and some at a reduced price. If you meed the requirement for this offer, you can go to http://www.xboxstorageupgrade.com/. This week on Gamerscore Blog they are looking at the Community Games Channel in the New Xbox Experience. In a few short weeks we will be coming through on the promise we made almost two years ago on opening up game development to the masses with the Xbox LIVE Community Games Channel. In this week’s Developer Diary, Xbox LIVE’s Major Nelson gives you a sneak peek at the kinds of fun and unique community-created titles that will launch as part of the New Xbox Experience on Nov. 19. 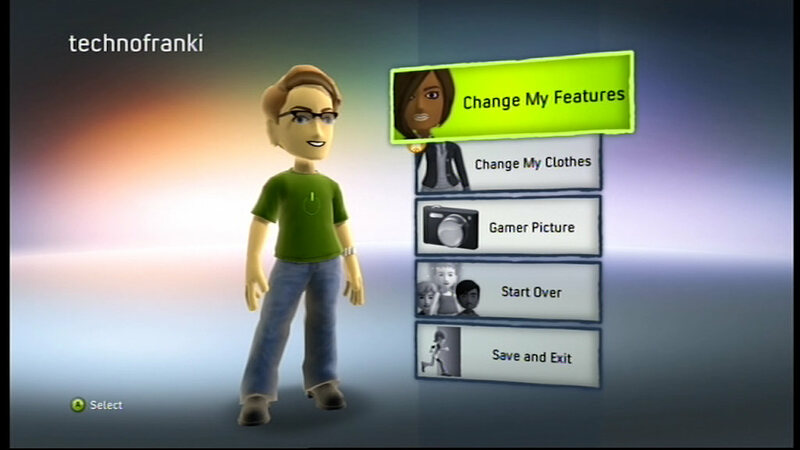 Not only is the channel an unprecedented opportunity for aspiring developers to share their ideas and creations with millions of Xbox LIVE members, but as gamers, you’ll have more choices than ever before, and it is all part of the New Xbox Experience. Here is an interview with Larry “Major Nelson” Hryb and Kathleen Sanders.